The New England Patriots thought it was going to be just another preseason game Friday night. As it turns out, the contest against the Detroit Lions could end up being a lot more. It could end up being a test of sorts. Two minutes into the game, Patriots fans saw something that had to make their hearts drop—Julian Edelman on the ground, clutching his knee, and in serious pain. So, how well can they click when they lose one of their primary weapons? Rob Gronkowski didn’t play much and didn’t record a catch when he was in so you could say Tom Brady was playing without his best two weapons. But did it matter? Absolutely not. In true Patriots fashion, the team marched on even though it was missing a very important soldier. Who stepped up is just one of the many observations that could be made from what ended up being a pretty entertaining contest. For those that care about the score in a preseason game, the Patriots needed a pair of late field goals, the game-winner as time expired, to beat the Lions 30-28. 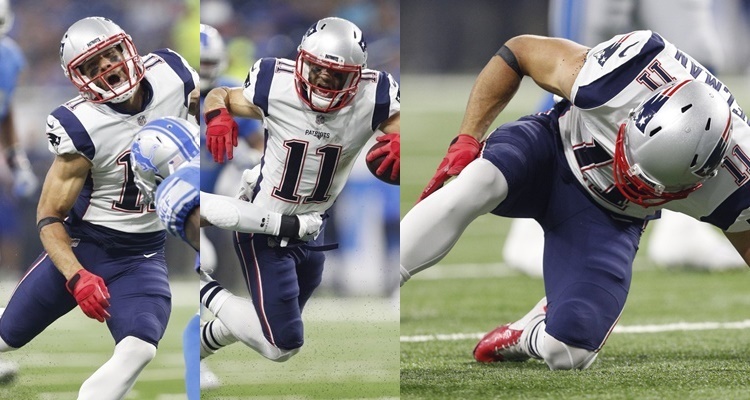 An MRI is supposed to be done on Edelman’s knee Saturday morning, but the belief right now is that he tore his ACL. With how he went down without being touched, it will not be surprising if that is what the results of the MRI say. Brady throws to Edelman almost ten times a game, so the Patriots will need someone to step up if he does indeed go down for the season. It appears that Chris Hogan will be the early favorite to do just that. Brady connected with him on four of five attempts for 70 yards and two touchdowns. Mike Gillislee finally got his first carry for the Patriots Friday night—and promptly scored a touchdown with it, a one-yard plunge late in the first quarter. He ended the night with 38 yards and a touchdown on nine carries. But most of it came on one carry of 27 yards. It will be interesting to see how the Patriots split carries going forward. Gillislee has shown some breakaway potential, James White is the Super Bowl hero, Dion Lewis is a tremendous threat as a receiver out of the backfield (when healthy), and then there is D.J. Foster. He had 65 total yards on 16 touches; against the Texans, he had 75 yards and a touchdown on ten touches. Could he be this year’s Dion Lewis (but minus the season ending knee injury)? 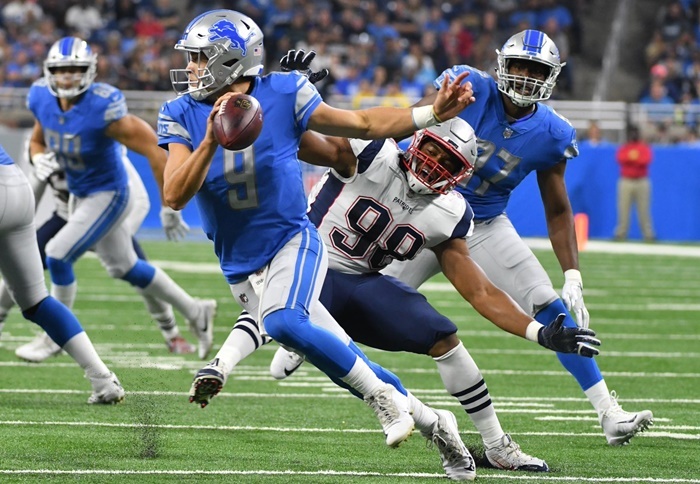 The Detroit Lions are not known for their defensive prowess, but Brady and company made it look too easy scoring 24 points on their first four drives. Matthew Stafford and the Lions offense had a pretty horrible first half against a very good New England defense. They started the game with a fumble, two three and outs, another punt, and an interception. Once they were down by 24-points, they were able to get it together and complete one nice six-play, 80-yard drive to get on the board before halftime. The Lions appear to have a winner at linebacker in fourth round pick Jalen Reeves-Maybin. But first round pick Jarrad Davis has been a disappointment, to say the least. Ameer Abdullah looked like fantasy football gold with 99 total yards on 16 touches. Project that kind of production over a full game, and it looks good for fantasy owners and Lions fans. Stafford looked good when he played (15-22 for 190 yards, two touchdowns, and an interception). His back-up, Jake Ruddock, didn’t look half bad either completing 10 of 13 passes for 113 yards and a touchdown. Detroit looks like a team that could be a contender. But it will have to figure out how to cut out the drive-killing mistakes (turnovers, penalties). It wouldn’t hurt if the defensive help they drafted could start contributing a bit more, too. The Lions will close out the preseason against the Buffalo Bills next Thursday (7 PM ET kick off) in Buffalo. New England will host the New York Giants (also on Thursday, kick off at 7:30 PM ET).